The St. Louis Cardinals are back in the hunt for the Commissioner's Trophy following last night's walk-off victory against the San Francisco Giants. Kolten Wong's dinger off of Sergio Romo evened up the National League Championship Series 1-1 as both teams head to the City by the Bay for Games 3-5. As a result, the Cards are in a much better position than they would be otherwise, but still at a disadvantage to Pablo Sandoval & Co.
St. Louis' odds of advancing to the World Series improved to 44%--better than the night before but still worse than their opponents'. The Cardinals' 4-1 odds of winning it all are the third best they've experienced this October. Despite their loss, San Francisco's 3-1 odds of winning it all are still their second best of the postseason. Because the Cardinals remain the weakest team standing with a .511 Power Score, their win improved the odds of both Kansas City and Baltimore in winning the World Series. Home field is still worth about a 3% advantage for the AL teams. 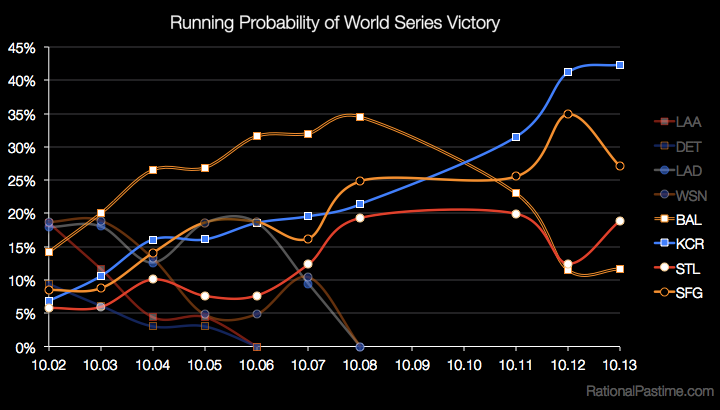 The most likely NLCS outcome is currently a Giants win in six, narrowly edging out a Cardinals win in seven. The Giants enjoy an 18% chance of advancing before the series returns to St. Louis, while the Cardinals only have an 8% chance of winning out. 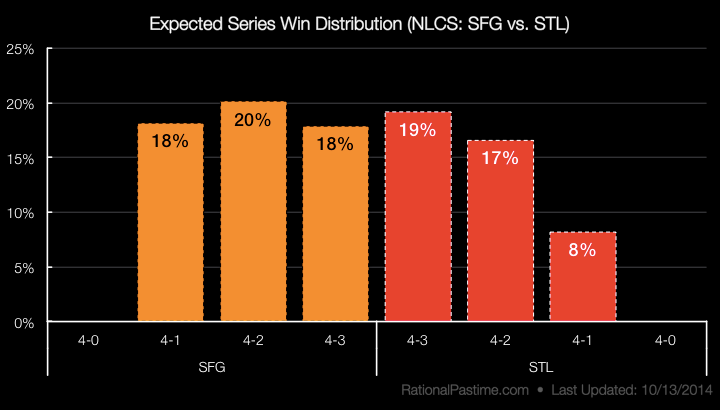 Even if the series were to return to St. Louis, the Rational Pastime model would favor San Francisco. The ALCS resumes tonight tomorrow night in Kansas City (thanks to rain), with the Orioles needing to win at least two on the road to stay alive. 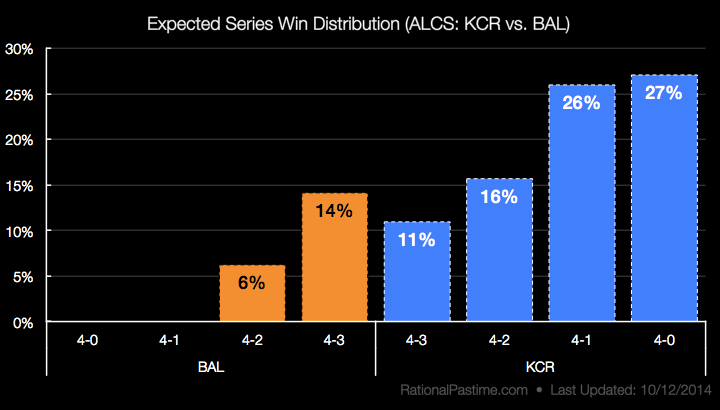 The Royals enjoy a 27% chance of sweeping the ALCS--the most likely outcome remaining. The Orioles are clinging to a 47% chance of merely forcing one more game in Baltimore. The Birds' best bet, at 14%, is to force a seventh game at Oriole Park. Despite San Francisco's loss, the most three likely World Series results all include the Giants, with the top two being a Kansas City in six or seven. 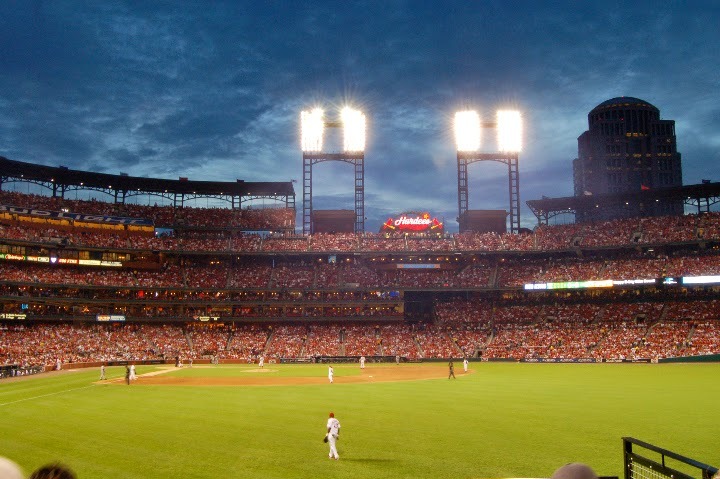 The Cardinals rebound improved the odds of an all-Missouri World Series to 35% and a rematch of the 1966 World Series against the Baltimore Orioles to 6%. 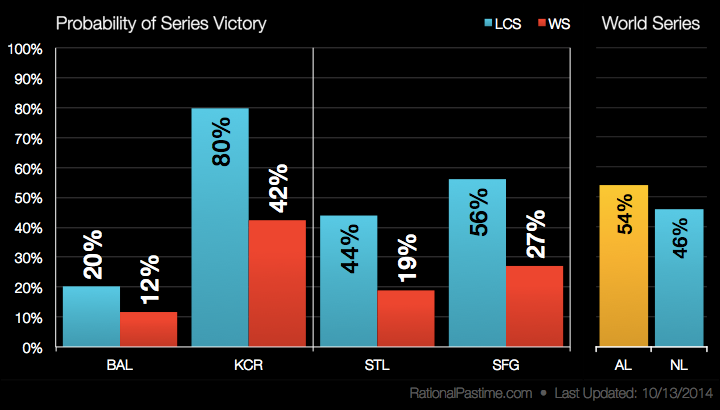 Stop by tomorrow for updated ratings, probabilities and charts following tonight's ALCS action.